This year’s national summer reading theme is “Every Hero Has a Story”. 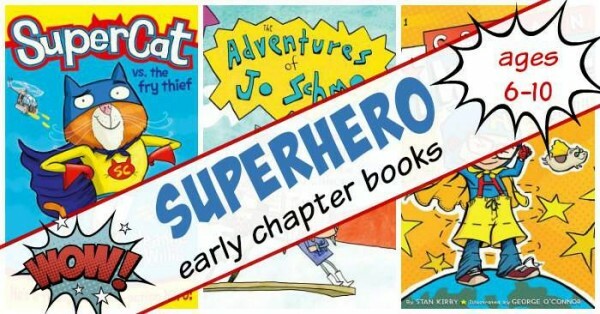 Now, such a theme is not limited to traditional superheroes, but it seemed like a good time to gather all my superhero chapter book recommendations for early chapter book readers into one place. Some of these books I’ve suggested before, but some new favorites are included. 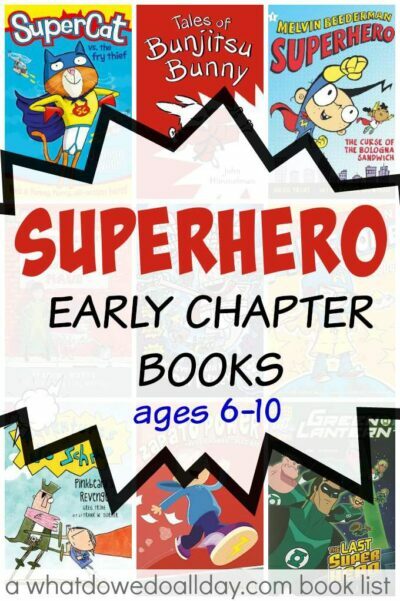 MORE: If your kids are delving into the world of chapter books for the first time, check out all our early chapter books lists, and read our parent tips for choosing early chapter books. Supercat vs The Fry Thief (series) is a British import that is silly and fun. I read the first book out loud to my 6 year old in one sitting because he wouldn’t let me put it down. It’s longer than some of the others on this list, but still has the trademark large font and copious illustrations that characterize chapter books for younger readers. Tiger the cat licks a toxic sock and transforms into a walking, talking super cat with opposable thumbs. He and his owner, James, set out to foil the plans of Count Backwards who is trying to destroy the potato crop with weevil bombs. My son laughed out loud at this book so much! Captain Awesome to the Rescue! is one of the easiest books on the list, perfect for beginning chapter book readers or kids who may be late readers and want to read chapter books “like their friends.” Eugene’s imaginary alter ego is Captain Awesome. With healthy imaginations, he and his friend Charlie, aka “Nacho Cheese Man” team up to save the neighborhood from wicked (imaginary) villains. Freddie Ramos Takes Off (series). I have a great love for Freddy Ramos, and you may recognize him from other lists. After all, he and his mom love to read together. It’s also nice to see a Latino superhero, do you know many of those? One day Freddy receives a mysterious pair of shoes which turn out to have magical powers and Freddy, being the kind of boy he is, uses their power for good. Tales of Bunjitsu Bunny is not exactly a superhero book in the traditional sense, but I’m including it because I love it so much and there is a lot of superhero-type action. It is composed of short vignettes about Isabel (the “Bunjitsu Bunny) and her friends (who also study martial arts). Each clever and funny vignette conveys a zen like lesson without being at all preachy. My 6 year old is very into the idea of battles and fighting these days (Yes, I know!) so he of course wanted me to read a book in which the first action sequence involved head butting a door (they don’t actually get that far…) but I was delighted with the “sneaky” lessons in non-violence, friendship, compassion and self-discipline! The Princess in Black is the much anticipated early chapter book series by the author of Princess Academy. Princess Magnolia’s secret identity has her fighting the local monsters when they harass the shepherd’s charges. Tongue in cheek humor, color illustrations, spare text and a bit of action make this a great book for early readers. When the shepherd decides to create his own alter ego, we know we will be getting a sequel. The Adventures of Jo Schmo (series). Unfortunately, there is a dearth of superhero chapter books about girls! Jo Schmo helps fill the gap. When she gets a mysterious package, (conveniently labelled “mysterious package for Jo Schmo”), a fourth grade girl joins the family business of crime fighting. Because Jo is a 4th grader, this is a good series to hand to older kids who are still working on their reading skills and may not want to read book that “are about little kids”, as many early chapter books are. There is also a lot of age-appropriate silliness, (not surprising as it is by the author of Melvin Beederman — see below)which makes the books fun to read aloud. Kung Pow Chicken (series) straddles the line between graphic novel and chapter book. My 6 year old LOVED this series and demanded I check all of them out of the library. It is the type of book, however, that has me wishing he would hurry up and learn to read already. In fairness, though, the puns did have me giggling. A young chicken gains superpowers when he accidentally falls into a mysterious vat in his uncle’s lab in their home town of Fowladelphia (see what I mean?). In this first adventure, he and his sidekick must figure out what is causing the local population to lose their feathers. Silly and fun. Melvin Beederman Superhero (series). Melvin has just graduated from the Superhero Academy and now on the job fighting crime in Los Angeles. But like his more famous counterpart, Superman, he has a weakness. That weakness? Bologna. Turns out his strength turns to jelly in the face of the cursed lunch meat. Fortunately, his new sidekick, Candace, is there to help. Even if she can’t seem to get all the superhero code lingo quite right. Super silly. Super fun. Extraordinary Ernie and Marvelous Maud (series). It’s been a few years since I first read this book and put it on my earlier list of Superhero picture and chapter books. Ernie has won a contest to become a superhero! But… hmmmm, his sidekick is a sheep? A very clever and sweet series from Australian author, Frances Watts. The Adventures of Captain Underpants. I understand that there are parents who don’t want their kids reading Pilkey’s funny series about a pair of boys who turn their principal into a ridiculous superhero who sports a mean pair of tidy whiteys. Personally, I think the series is no more subversive than Roald Dahl and I do think it can be good for kids to have an outlet for their feelings about school. My son loves these books, yet still shows great respect for his teachers and principal. If your child has breezed through all the books on this list, try these two other books which are more appropriate for 8-12 year olds, but which we have also enjoyed. Thanks for sharing this list. Good chapter books for kids, especially boys, are hard to fine so it is always nice to have a reference. I have Tales of Bunjitsu Bunny to read and review, but I’ve been dragging my heels with it. Now you’ve tempted me to pull it out and finally read it. Great (and much appreciated) list! We also love the gum girl books by rhode Montijo– Hispanic girl superhero? Yes, please! Oooh, thanks for the suggestion! I know my son has read that book; I forgot about it. Great addition. So excited that my 5 year old had me read through his first entire chapter book tonight and it was Captain Awesome. He loves Bunjitsu Bunny and Captain Underpants too, although I think he is more into the comics on Captain Underpants than anything. I’ve got Kung Pao Chicken ready to try next. Yay! I love Bunjitsu Bunny so very, very much!